Our TechnoStrobe Funlight is 4 feet of High Bright 2.6mm Cool Neon wire soldered to our TechnoStrobe driver. It has a side switch with on, off, or strobe modes as well as a handy belt clip. Our TechnoStrobe Funlights now come with an extra clip so that you can attach your Cool Neon wire to just about anything! The strobe option is super cool, allowing your Cool Neon wire to appear to be in motion even when held still. Two AA batteries are included. 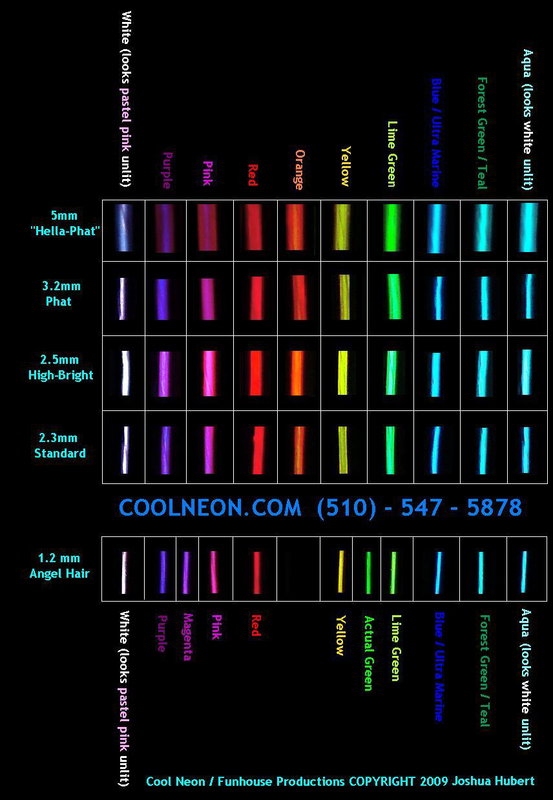 VISIT HERE FOR OUR NEW COLOR CHART! We suggest these related items from other sections. The Recharge-It-All Universal Battery lets you keep your collection of battery chargers and replacement AA batteries home for good! Zap! is a renewable, on-the-go power source for your mobile electronic devices. With a USB cable and 8 cell/media power tips, it can power or charge most cell phones, cameras, or other electronic gadgets regardless of what battery they use. And with its own 4 rechargeable AA batteries, you don't even need an AC outlet to charge your devices when you're on the road. Use them also to continuously resupply any AA device. We're VERY excited to bring this amazing new "Smart Battery" Technology to the Cool Neon Alternative Energy Line.